Gensler, a global architecture, design, and planning firm, is known for, “delivering projects as large as a city and as small as a task light for an individual desk.” Continuous ideating and innovating around how individuals relate to, and engage in various architectural spaces has led the Gensler experience design team to take a deep and creative dive into the interactive world of digital signage. “As with all projects of this nature, it takes a group of people to make magic happen,” said Alan Robles, associate, experience designer at Gensler (inset). 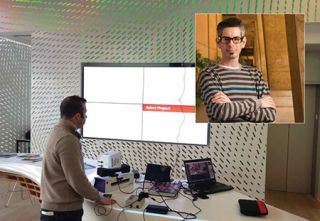 “Yahav Ran, multi-display expert and co-founder of digital signage and interactive agency, The Hive, and his creative team were instrumental in developing and converting the concept into a tangible experience.” “This whole office is kind of a working experiment,” said Alan Robles, associate, experience designer for Gensler, and instructor for the UCLAx Design Communication Arts program, describing the award-winning, downtown Los Angeles office. In May 2013, the lobby was transformed into an augmented reality experience, called The Hive/Gensler Multi Surface Experience to showcase the firm’s portfolio of work. The magic begins as visitors enter the lobby and walk into an experience that attracts them towards an augmented table and book. Microsoft’s Kinect for Windows cameras interpret the reality of the lobby, allowing the experience to be reactive to its surroundings in real-time, while a Canon REALis WUX5000 projector displays the interface onto the table. A four-panel, 4K, Planar Clarity Matrix LCD Video Wall System displays digital content from the book using software from YCD. The Hive team developed custom software that enabled the augmented reality components to create an immersive user experience. The Gensler/Hive team is currently working on the next phase of the Multi Surface Experience. “We’re going from the Kinect 1 sensors to the Kinect 2 sensors and increase the activation from two people to six people, and we’re going to be able to increase the range and the resolution of what the cameras can track significantly.” Already in hand and ready for installation are Planar’s 84-inch 4K touchpanels. “We’re going to add things like touch, so that while one person is using the table and the projected interface to interact with the videowall, the other person, the host, could be standing at the videowall, answering questions about what the person is seeing as they browse, and also activating content on the display itself by touching different parts of it,” Robles added.